Client injury from falling during task. b. Check client for signs of injury if on the floor due to a fall. If injured, seek medical assistance and apply first aid. If the client is injured, do not attempt to move client. c. This instruction details how to complete this task with one worker. d. Be aware of movements during task, do not exceed your ability. Ensure all handling is done with flat open hands. Make sure there are two chairs available to use in this task. Carry chairs over to client before commencing task. Modify task if only one or no chairs. Assist client to roll on to their side. First, check the client for any injury. If injured, do not move the client — get medical assistance. If no injury, request and assist client to roll away from worker. Place client's upper arm's hand in front of chest. Assist client to lean on to their elbow. Assist client to roll their upper torso forwards to rest on elbow. With elbow stabilising pelvis, use hand to lever down and forwards at elbow, with other hand under client's lower shoulder. Do not lift up sidewards but create a forward roll of torso into leaning on elbow. Bring client into a sitting position. Place an open palm on client's lower chest, near armpit. At same time, using an open palm, apply downward pressure to the front of the client's pelvis, to gradually bring them into a sitting position. 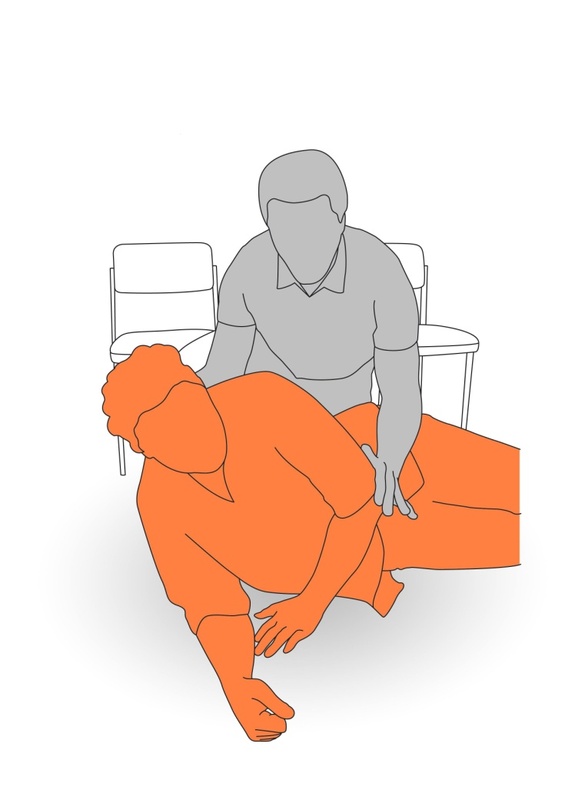 Place client's arm and opposite hand on to chair for support and assist them to move into a kneeling position. Ask and assist client to place their arm on to the chair for support. Assist client to reach with other hand on to the same chair. Prompt the client to begin turning to face the chair, which may include helping to turn them through the shoulders. Support the pelvis as shown and ask the client to move up on to their knees. 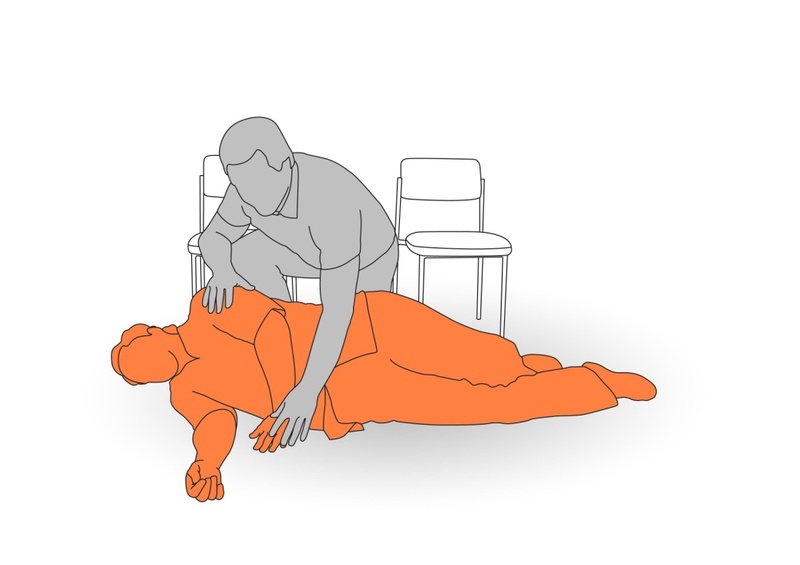 Assist client into a half kneeling position. With client now facing towards chair, assist client to lift up one leg to be in a half kneeling position. Move second chair into place behind client, place under buttock of the leg that is raised. Assist client to sit up into chair. Assist client to lean forward and to use their hands for support to push hips back. Assist them to sit back safely into the second chair. Reassess client before attempting further movement.